I guess only a few of the people reading this haven´t made the unfortunate experience already that something they would want to buy wasn´t in stock, or at least was not in the quantity in stock they would like to have bought. As frustrating as this is on itself already, it gets even more frustrating if you need a larger quantity of that product – as it often might be the case for example with bitz such as shoulder pads or helmets – and might be forced to order the amount you need in portion. Well, since we are a small company that has just started business, I can´t promise you of course that you won´t ever find some of our bitz out of stock. We will do our very best to prevent that from happening, but please understand that it might happen nevertheless from time to time though. If it should ever happen to you, please check back again a few days later and most likely our stock will have been filled up again by that time. What we can prevent though is, that you will ever be forced to proceed as described above and will have buy a larger number of products in portions. To prevent that from happening, we have created our “Request large Number of Bitz” – Service. 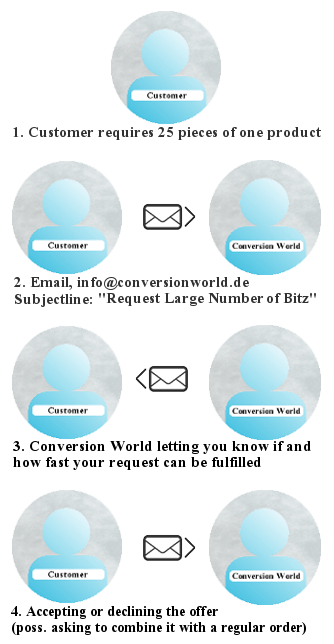 If you would like to buy 25 or more pieces of one specific product but there aren´t that many products in stock, feel free to send us an email to: info@conversionworld.de with "Request Large Number of Bitz" as subject line and tell us what you would like to buy and in what quantity. We will check your request then as soon as possible and will tell you if and how fast we can produce the products you asked for. You can combine several large number requests of course and you can also combine a large number request with a regular order of course. (Most likely it will even be advantageous to do so, to save up on shipping costs.) If you want to combine a large number request and an order that way, just send us the request as explained above and after we accepted your request, place your order. When doing so make sure you add a note to the “Add a personal message” box during checkout, saying that we accepted a large number of bitz request from you and that you wish for both, request and order to be shipped together, once we produced the products you requested. We look forward to your request and promise to accept as many of them as possible.